The Orioles’ bullpen has been mercurial at best this season, but the O’s could always rely on Zach Britton, the surefire lefty whose 47 saves and 0.54 ERA this year have him deservedly in the running for the American League Cy Young award. Britton is the Orioles’ closer, but more than that, he’s their stopper. They sure could have used a guy like him Tuesday night in Toronto. Britton got up from his seat in the bullpen to warm up once in the American League Wild Card Game, but never entered the contest. But Ubaldo Jimenez did enter the contest in the 11th inning with the score tied 2-2, and he gave up two singles and then a monster walk-off homer to Edwin Encarnacion. Britton, whose Win Probability Added this season was the highest for an American League pitcher since Pedro Martinez in 1999, was healthy and could have easily been ready in the highest-leverage moment of the game. But Orioles manager Buck Showalter didn’t want him. Showalter even came out to the mound when runners were on first and third with one out and Encarnacion stepping to the plate. He had to have considered bringing in his best pitcher at that critical moment, just as he had to have considered bringing him in two innings before, and the inning before that. But he didn’t bring him in — he kept a starter in the game. “No one has been pitching better for us than Ubaldo,” Showalter said after the game. Jimenez had been great, yes, but he wasn’t good enough Tuesday, and that was apparent after the back-to-back singles. When a sacrifice fly can win the game, you need someone versed in high-leverage situations on the mound. Jimenez is a starter — he doesn’t pitch under the same kind of pressure as a late-inning reliever. Turns out, he didn’t even have time to feel the stress of the situation. One pitch — game over. Showalter was barely back in the dugout. Buck is an old-school guy, and while he didn’t go full mea culpa after the game when he was asked if he regretted not pitching Britton, he did say, "You do afterwards." But not pitching the closer in a non-save situation is a tried and not-so-true holdover from a previous era of baseball. A dumber era of baseball. Relievers are not used by inning or concrete situation anymore, they’re used according to leverage. No situation had more leverage than Encarnacion’s at-bat, and no pitcher was better suited to be throwing to him than Britton. Showalter’s entrenched and antiquated stance on how to handle a bullpen — a major problem throughout his career, by the way — ended the Orioles’ season. And if he wasn’t saving Britton for a save situation, that’s even worse. 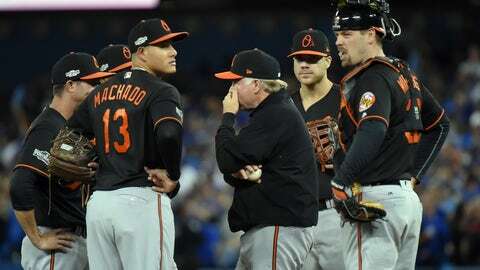 Yes, there were dozens of other things that happened in the game that shifted the outcome, and perhaps Britton would have allowed a game-winning sacrifice fly to Encarnacion anyway, but the crux of the situation is this: Showalter was planning to use Britton in a scenario that wasn’t guaranteed to happen — he was saving his best pitcher for a moment of minimal importance, comparatively. Even if it worked out in the 11th, as it had in the 8th and 9th when Showalter didn’t bring in his closer in a tied game, the decision to leave Britton on the bench was poor. That at-bat was the game — that at-bat was the Orioles’ year. Showalter had the best pitcher for that situation in all of baseball at his disposal, and he decided not to use him. That’s terrible managing. There’s no excuse for that. And because of that terrible management, there isn’t another inning or game for Britton to pitch in this year. The Orioles’ season is over, and if you need someone to blame, you can direct your attention to Buck Showalter.